One to ten day Adventure Training and Physical Education classes in Northern California during May, June, and September. Teaching the basics of White Water River Rafting, Outdoor Top-Rope Rock Climbing, Canyoneering, Backpacking and other guided outdoor adventures while helping Christian students to grow in their personal relationship with their Savior Jesus Christ. Most of these classes are designed for students 12 years old and up. 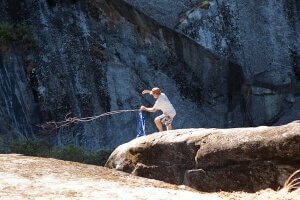 While these are optimal for those interested in becoming an outdoor adventure guide, these classes are also open to the those that simply want to learn more about these high adventures. Training for Mission Trips – Helping your team hit the ground running on your mission trips by getting the awkward team building and unification accomplished before you leave. Guide School Training – An intensive two week training program for individuals 18 years old and older who are interested in learning more about working in outdoor youth ministry.